The Kumasi Central Prisons, established in 1904 to accommodate 600 inmates, is to be relocated to allow expansion of facilities and ease congestion. The proposal is currently receiving priority attention by the authorities, Mr. Kofi Oppong Tweneboah-Kodua, the Deputy Director of Prisons (Ashanti) disclosed when the Regional Minister, Mr. S.K. Boafo who is also the Member of Parliament for Subin paid a surprise visit to the prisons last Friday to acquaint himself with conditions there. The Asantehene, Otumfuo Osei Tutu II and the Regional Minister, Boafo are said to be very instrumental in the plans for the proposed relocation. 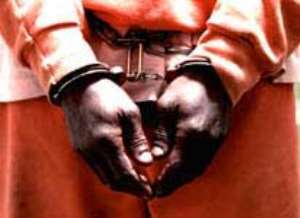 The Kumasi Central prison currently has a total of 1,363 prisoners, including 399 remands as at March 19, 2004. The 40-capacity female prison is currently overcrowded, and the total number of inmates in the various prisons in the region is 1,877, including 19 condemned prisoners. The Prisons Director complained that the trade workshops at the prisons were under - resourced. Boafo told the inmates that the government was considering major reforms in the prisons under the HIPC relief funds in the area of sanitation. The Subin MP who had previously donated a 2000-gallon capacity water tank to the Prison, promised to provide basic materials for the trade workshops as soon as the prison authorities make their needs available to him. Boafo took the opportunity to confer in private with former Minister of Agriculture, Mr. Ibrahim Adams, currently serving a jail term for causing financial loss to the State. At the female prisons, the regional Minister showed empathy towards an elderly woman and volunteered to pay a fine of ¢1 million for her release. Madam Adwoa Fordjour of Apitiso near Obuasi had been fined ¢1 million or in default, serve 12 months in prison for failing to pay stool land tributes. She had served almost five months of the sentence.